This is a nice example of how "The New Look" made its way into all aspects of women's clothing, not just dressy clothing. What makes this "fancy" apron such a wonderful example is that the essence of the new look shape has been captured in the shape of the applied pockets. Probably M. Dior didn't foresee this apron in 1947 when he launched his stylistic sigh of relief that World War II was finally over. 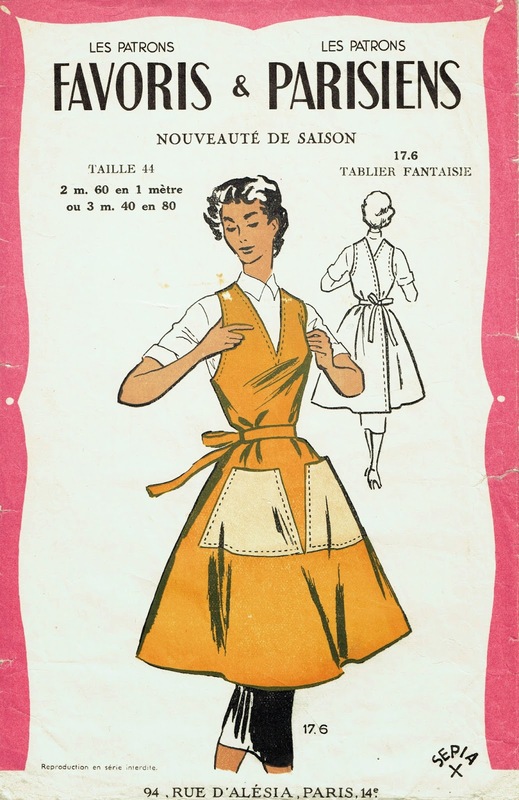 The instructions indicate that this apron can be made up in gingham or cretonne (a printed cotton fabric often recommended for aprons) and that the pockets, as shown in the illustration, can be cut from a contrasting fabric. This style with a full back wrap is also popular at this period in the United States. This cut, unprinted, pattern doesn't include allowances for either seams or hem, and was produced in only a single size. French patterns were typically offered only in a single size with a bust measurement of about 38 inches. Not having the seam allowances actually makes it easier to alter the pattern. Note the small box on the back of the envelope that describes how to resize the pattern. There are some interesting questions around this. Where did women learn to alter patterns with confidence? Altering an apron is one thing - altering a pattern for a suit jacket is another matter entirely. Could women hire somebody to alter home sewing patterns for them if they weren't confident of their own skill at this? What was women's tolerance for less-than-perfect alterations? 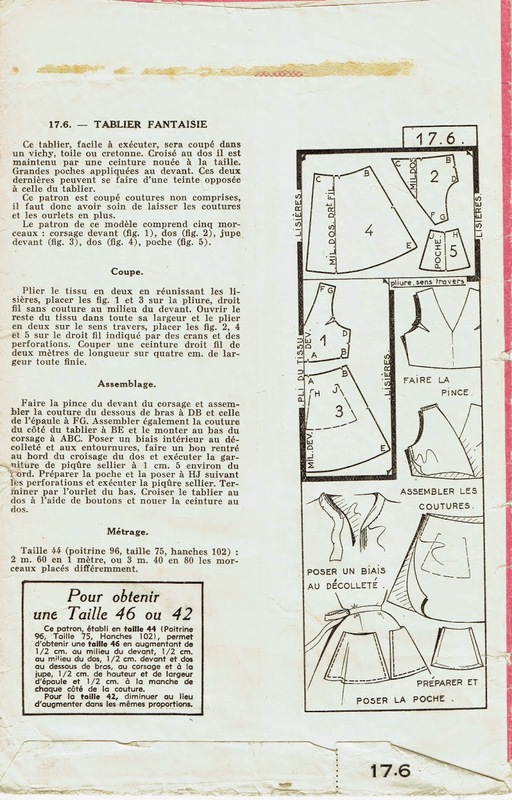 Striving to avoid that "home-made look" comes up repeatedly in home sewing books, but for the demographic who bought these patterns, was a slightly gappy neckline or twisted sleeve acceptable? Oh my goodness! That is exactly the type of apron I've been searching for. Are there any more copies out there? I don't like anything around my neck, and it's difficult to find apron patterns that go over the shoulders rather than around the neck. Are going to sew this one up? Would love to see it. Very similar styles were available from the U.S. pattern companies and show up on eBay pretty regularly - you might want to keep any eye out there. I'd like to make up this one, but it's going to have to get in line behind at least a dozen other sewing projects!